1. Peel the bottom of the asparagus spears and slice the spears on rounds. 2. Heat the oil in saucepan and sauté the shallot. 3. Add the asparagus and white wine. 4. Cook over low heat for 5 minutes. Season with salt and pepper. 6. Add the saffron and cook the farfalle until al dente (not too soft bust still with a bite). 7. 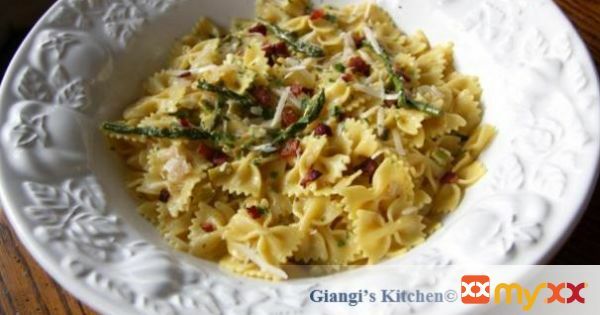 Drain the pasta and toss with the asparagus. 8. Add the butter and mix well. 9. Crumble the bacon over the pasta, grate some Parmesan Cheese and sprinkle with parsley.